Blackjack Switch is a casino game based on the classic game of blackjack. The creator of this already popular variation is Geoff Hall, who received his patent for the game in 2009. Hall was mostly preoccupied with counting cards and he was greatly annoyed when he had two weak hands. He thought that it would be great if there was a Blackjack game where players could switch the top cards of their two hands, so he worked on the idea for a while. The first time that Hall presented the game was in 2000 at the G2E conference in Las Vegas, and a year later the game received its first true exposure by being offered at Harvey’s Casino. After that Blackjack Switch steadily grew into a true blackjack variation favored by blackjack enthusiasts. 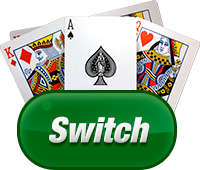 Today, the most popular and widely played Blackjack Switch game is the one offered by Playtech. The concept of Blackjack Switch follows the basic concept of blackjack, which is great, but there is one very significant difference. In Blackjack Switch the player receives two hands at the beginning of each round and has the option to switch the top cards of his two hands, and thus form two stronger or at least one strong hand if both are weak. The game starts by placing two equal bets after which four cards are dealt, two for each hand. The first thing that the player can do is to switch the positions of the top two cards, and after that the game follows a standard blackjack procedure. Natural blackjack in this variation is paid even-money, and not 3 to 2 as in the classic version. As any other game, Blackjack Switch too has some tips and hints that you can use. There are also many basic and advanced strategies that you can find online and implement in your game, which were created especially for playing Blackjack Switch, but the instructions are too long for this article. If you have anything between 17 and 21 you should always stand, no matter what the dealer has.